•The Company has been certified by TNV, UK for compliance of ISO 9001-2015. •The Company has been audited for Certification by REENA on behalf of Indian Administration for Compliance with relevant application of MLC 2006, Compliance.. Company has been endorsed our RPSL License accordingly. 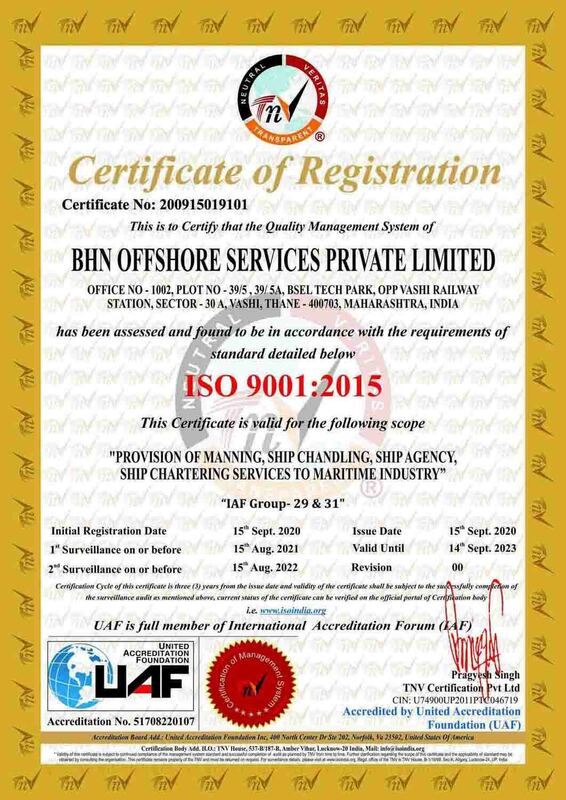 •The Company has been registered with Government of Maharashtra as Commercial Establisment with activities which includes Crew Manning, Ship Chandling, Ship Chartering, Ship Agent, Manpower Consultant and issued with relevent registrationCertificate. •The Company has been registered with Government of India as Importer - Exporter and allotted IEC Code-0314062971, and issued with relevent registrationCertificate.